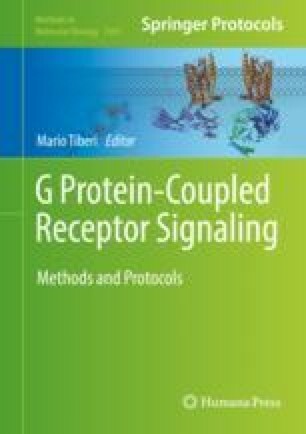 Interactions between G protein-coupled receptors and their ligands hold extensive potential for drug discovery. Studying these interactions poses technical problems due to their transient nature and the inherent difficulties when working with G protein-coupled receptors (GPCR) that are only functional in a membrane setting. Here, we describe the use of a furan-based chemical cross-linking methodology to achieve selective covalent coupling between a furan-modified peptide ligand and its native GPCR present on the surface of living cells under normal cell culture conditions. This methodology relies on the oxidation of the furan moiety, which can be achieved by either addition of an external oxidation signal or by the reactive oxygen species produced by the cell. The cross-linked ligand–GPCR complex is subsequently detected by Western blotting based on the biotin label that is incorporated in the peptide ligand.